Bees worldwide are under threat. Bee colonies are collapsing on a frightening scale. The main culprit that has emerged is a new type of insecticide which is a neurological toxin that affects information processing in the bee’s brain. After a while they can’t navigate home. Foraging bees die before they can get back to feed the babies or they pass it onto the babies and queen. In SA we are now using these toxic insecticides even though they have been banned in Germany, France and England. Bees pollinate two-thirds of all our food. Their contribution to the SA citrus industry alone accounts for 1.6 million rand in value. When scientists noticed that silently, they were dying at a terrifying rate, Avaaz swung in to action, and kept on swinging until they won. 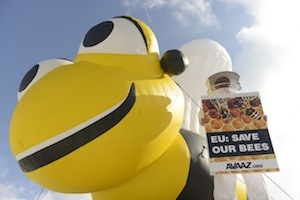 This week’s victory is the result of two years of flooding ministers with messages, organizing media-grabbing protests with beekeepers, funding opinion polls and much, much more. However, the EU ban is only in place for 2 years pending further review. In South Africa and across the world there’s lots of work to do to ensure sound science guides our farming and environmental policies. Categories: Avaaz, Bees, Inecticides, Organic farming, Uncategorized | Tags: Bees, colony collapse syndrome, insecticides, organic farming, organic gardening, permaculture, pesticides | Permalink.